It’s our joy to create beautiful and unique arrangements, and we are continually seeking out the most perfect blooms and graceful foliages. From our initial consult to production, we’ll work directly with you to create a lovely floral vision for your event. While we specialize in weddings and events, we are thrilled to provide flowers for baby showers, parties, and corporate events. If you have a unique request, contact us! When you reach out to us, we’ll arrange an initial phone or email chat about the scope and budget of your event, as well as your inspiration and ideas. Then we’ll get down to work on a design proposal that reflects your vision. We take pride in providing you with a detailed plan so you can rest assured that each floral moment will be perfect. When you approve your proposal, your 50% retainer would be due to secure your date on our calendar. 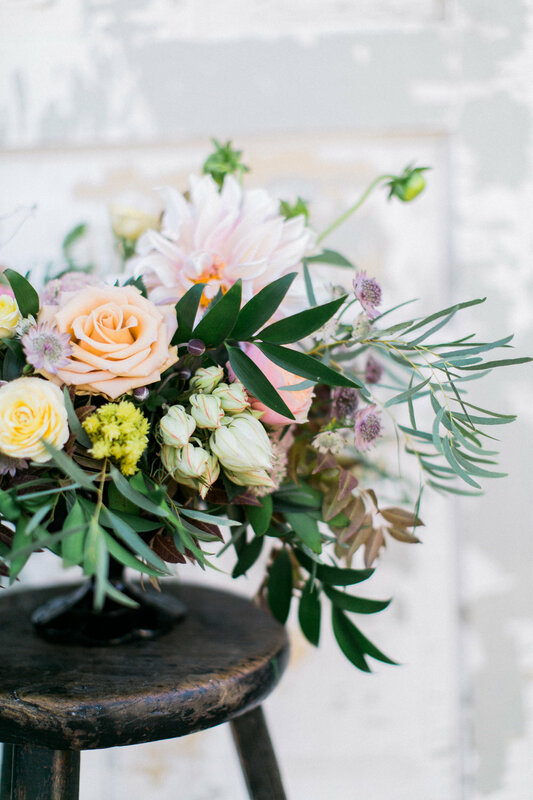 Then we’ll begin sourcing vessels and planning for the most perfect blooms for your event. Because we only accept one full-service delivery per day, we can ensure that your event always gets the time and attention it needs, and we’ll be there personally to see it through. We order flowers on a per-event basis, so some basic minimums apply. Orders that are personals only (bouquets, boutonnieres, corsages, crowns) can be expected to cost $1000-$1500 depending on the number of pieces, floral choices and sizes of each piece. Centerpieces tend to start at $100 per piece. Events with larger pieces such as arches, installations, or tablescapes tend to start at $3500. During our busy season (May to October), there is also a $3,000 minimum order for full-service events. Full-service events have a design, delivery, and setup fee. For smaller orders, we’re happy to have your pieces ready for pick up from our Ann Arbor studio between 9:30am-11am on the morning of your event. We are excited to offer gorgeous stone, brass and glass containers for rental. We also provide giftable containers for purchase. Additional ceremony arrangements and arch/chuppah designs are also available.